My goodness, I can’t let October end without giving you all a pumpkin recipe! What kind of blogger would I be? Well, I would be the kind who has been away for oh…5 weeks out of 8 the past two months? I knew that this fall was going to be busy, that I would barely be at home but until you are in the thick of it, you don’t really get how busy you are going to be. Add in homeschooling the kids and well, I barely have had a moment to write on here, so thanks for hanging in there and being patient! 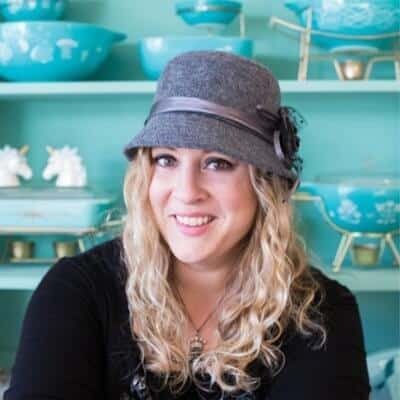 While I know you have been completely bombarded by pumpkin recipes – and even I get tired of them, I really do! 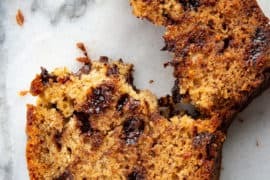 – this recipe is thanks to the kids and Mike. They wanted pumpkin muffins thus I happily pulled out a can of pumpkin and started baking. 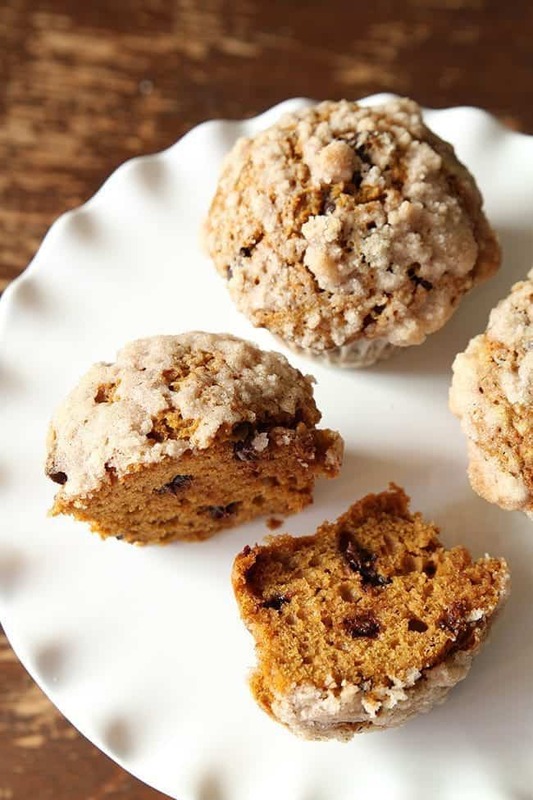 These take my favorite type of muffin – chocolate chip pumpkin– and make them completely junky. White sugar, oil and a delicious struesel take my healthier version and make them decadent. So be honest with me; are you tired of pumpkin recipes? Are you ready to move on to soups and stews? (I hope so.. because I have tons of cold weather recipes coming!) Or are you on the “pumpkin is timeless” bandwagon? 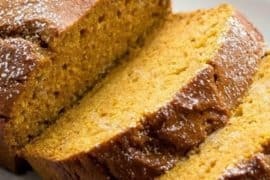 I love pumpkin so I bake with it year round, but I am ready to move on! PIN THIS RECIPE to your MUFFIN RECIPES Boards and Remember to FOLLOW ME ON PINTEREST! Decadent chocolate chip pumpkin muffins made seriously delicious with the addition of a crunchy struesel on top! Combine the first five ingredients together in a large bowl thoroughly. Whisk together the dry ingredients (excepting chocolate chips) and then add to the wet mixture. Mix until just combined then add chocolate chips. Make sure not to over mix. Divide into 12 muffins tins. 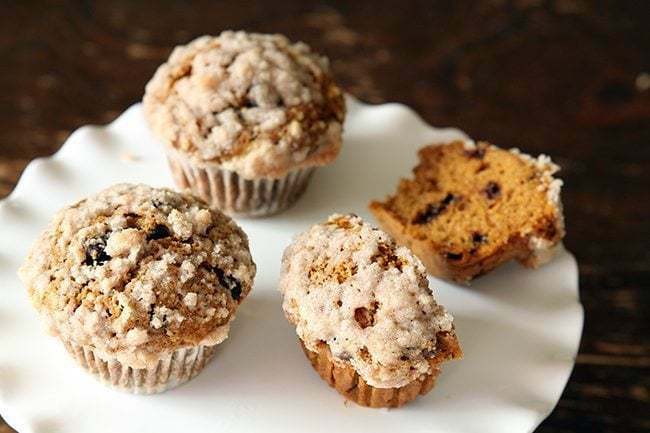 Combine the streusel toppings; divide into 12 and place on top of each muffin. Bake at 375 degrees for 15-17 minutes. Love pumpkin during all seasons. And chocolate chips in pumpkin muffins are one of my family’s favourites! Pumpkin as a veg, as a soup and in veg stews! It’s healthy stuff. Where d’ya think you’re going? 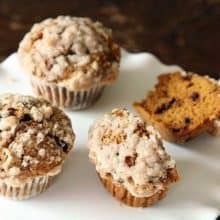 These muffins are so great and a huge hit with kids! I made them last week with my son for his class Halloween party. We replaced the water with orange juice which gave them a bit more zip. He said they were all gone in about 5 seconds at the party and everyone loved them. Thanks for sharing! 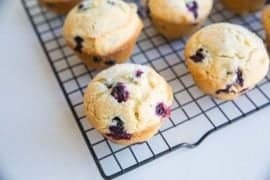 These muffins are so great and a huge hit with kids! I made them last week with my son for his class Halloween party. We replaced the water with orange juice which gave them a bit more zip. He said they were all gone in about 5 seconds at the party and everyone loved them. Thank for sharing! @Sarah Oh the addition of orange sounds lovely!! I am so glad that they were a hit!